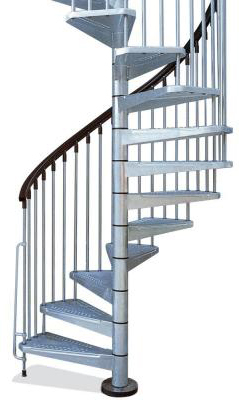 Galvanized spiral staircases are ideal for use outdoors as an alternative entry or exit into a second floor apartment or for use with an outdoor deck or balcony. These staircases are made from sturdy steel and then hot dip galvanized to ensure that they are both weather and corrosion resistant. A new outdoor spiral staircase can be quite stunning – adding beauty and function to its surroundings. But without any protection from the elements, it can quickly become rusted and begin to look old and ugly. Not to mention that fact, that the more it rusts, the more unsafe it will become as well. Both the beauty and safety of the staircase therefore need to be protected through a process called galvanizing prior to assembly and installation. zinc coats every part of the staircase and hardens to form a weather proof barrier that will help to keep your stairs in great condition for many years. This protective barrier is virtually maintenance free and will prevent your spiral staircase from rusting and corroding. Many of the reasons for choosing a spiral staircase for your exterior are the same reasons that you would choose this type of staircase for your interior. These stairs are incredibly compact compared to conventional straight stairs. So if you want more room for a deck, flower bed, pool or barbeque, it makes sense to take up less room with stairs. They are also quite convenient and don’t require a lot of extra construction work for them to be installed. Spiral stair cases are often more cost effective as well. This means that you’ll get to enjoy your outdoor space sooner and have more cash in your pocket to help fund those backyard get-togethers. At first glance, galvanized spiral staircases may seem a little more utilitarian and perhaps seem to have less visual finesse than their indoor counterparts. But the truth is, that these practical stairs can be just as beautiful and customized as any other element of your exterior décor. Treads – steel and iron treads can come in a variety styles including various coverings and sleeves. Balusters and Tips – both standard and more ornate balusters and tips may be selected. Handrail caps – these are usually available in your choice of vinyl or aluminum. Balcony and deck rails – while not part of the stairs themselves, many homeowners opt to have balcony and deck rails that complement their galvanized stairs. To order your staircase, simply use the online measuring tools on our website to determine the right height and diameter for your location. Contact us today to place your order, or contact us for more information.